Just what is integrity? Some people say integrity is represented by the way you feel about yourself at all times, in the fact that you know you have to live with yourself, and that you have to face yourself in the mirror every morning. You are either honest with yourself or you aren’t. You either know yourself or you don’t. Integrity is holding fast to what you, at your gut level, really are. When you know that you are a person of principle, that you can’t be bought, even by yourself. Your integrity is something to be prized above all else. Loss of integrity comes from selling out regardless of the reasons. Some people sell out for the big bucks, some for prestige, some for glory, some for power, some for popularity and some out of fear. Whether in the field of entertainment, sales, politics, sports, business, education or any other walk of life for that matter, you can win by sticking to your principles. You don’t ever need to be a loser. 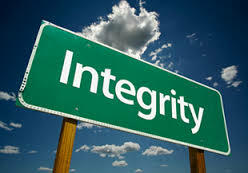 Here are some of the things that, if followed, can help to keep your integrity in good shape. Stick to these guidelines and you’ll be in little danger of selling out. Protect your good name. Your name should be recognized at once as standing for honesty and sincerity. It should be a name to be reckoned with. It is your very own trademark. It’s important that you don’t allow yourself to become Brand X. Your goal: Create a winning image just by the mere mention of your name. Keep the right company. The fact is your reputation—no matter how spotless it is—is often judged not by what you say and do, but whom you are seen with. Don’t be seen socially or in business or in other situations with people you know to have a reputation you want no part of. Sometimes it’s not possible to know, but when you do know, split. Stick to your principles. You have a set of beliefs you were brought up on. You carried them, hopefully through your school years and into your work life and other adult activities. Trouble is, there’s always somebody around trying to get you to give them up. Sticking to your principles is standing by what you know to be right. Here’s what you should stick to: honesty, keeping your word, honoring commitments and respect for the other person’s rights and ideals. Try saying no. Such a little word. Only two letters that can work wonders for you. Yet, saying yes to everybody can get you bogged down in more pitfalls than you can count. It’s harder to say no sometimes than it is to sell out. Selling out in this instance means selling yourself out—letting others eat up your time, letting others pick your brains, letting others talk you into carrying their load, letting others impose on you, in short—letting others con and control you. Actually, nobody likes yes-men. In time, you’ll be respected for your firm no, you’ll be less imposed upon and when you do say yes to something it will carry far more force and meaning than it ever did before.